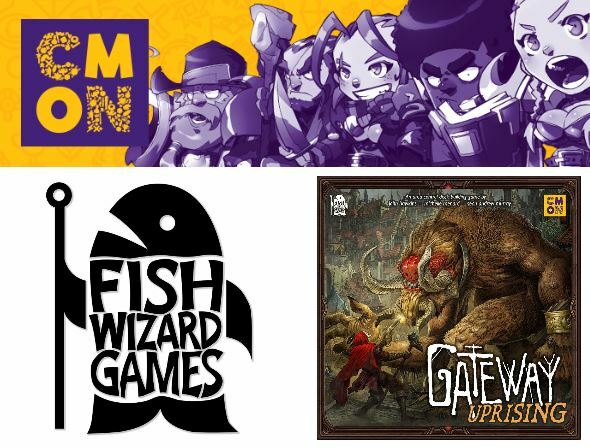 One last press release coming out of Gen Con 2016, and another partnership to tell you about with CMON. This time it's with Fishwizard Games. Those here at the show might have seen in the case a game called Gateway: Uprising. A few more were able to get a demo of the game. Well, those not here in Indy will soon get a chance to try it as it makes its way to you at the start of next year. In Gateway: Uprising you will be in charge of groups of wizards looking to bring down the wicked Chancellor, who has determined that magic should only be used by him and his cronies. So, going from district to district, the players need to work their way through the city. However, danger lurks around every corner in the form of the Druegger, who are looking to burn your precious city to the ground. So you've not only got to recapture the city for yourself, but you must do your best to make sure there's still a city to be recaptured! The game will come with 390 full-color cards, as well as 10 district boards. It will seat 2-4 players, ages 14 and up, and as I mentioned, will be out the first quarter of next year.